This blog has been dormant now for 8 months: real life and sheer laziness had come in the way and I kept putting off updating it. Rains in my city, which forced me to stay home from work today proved to be the catalyst. I decided to post something – just anything at all. So that this becomes active again. Asha Bhosle happens to be one of my favourite singers; and what better than a song list featuring her songs! It does so happen that her 83rd birthday falls next week, on September 8. Reviving my blog with 10 of her songs she sang for the dependable but lesser-known music director Ravi. Any article / write-up on Ashaji speaks of her collaboration with either OP Nayyar saab or the Burman father-son duo. Yes, after all they played a pivotal role in her rise. While not as feted, her collaboration with Ravi resulted in a substantial output, both in terms of quantity and quality. Here are 10 songs Asha Bhosle sang for Ravi, that I like in no particular order. While I have tried to limit it to solos only, a single duet has crept in! I have also tried limit myself to songs that have not been listed on this blog. This meant that my all-time favourite Aage bhi Jaane na tu does not find a place in this list. Chanda mama door ke (Vachan, 1955): Born Ravi Shankar Sharma, he started his career in the music industry as an assistant to Hemant Kumar. Hemant Kumar encouraged him to venture out as an individual music director and he made his debut in Vachan (1955). This lullaby, picturised on the delightful Geeta Bali, remains one of the most popular Hindi lullabies ever. I learnt this song way back in school, only to realise much later that this is a filmy lullaby and not one of those Hindi folk songs! Incidentally, Ravi has composed several popular children’s songs, for example Dadiamma dadiamma maan jao (Gharana, 1961) and Hum bhi agar bacche hote (Door ki aawaaz, 1964). 2. Raat raat bhar jaag jaag kar (Pyar ka saagar, 1961): Even though Lata Mangeshkar sang most of Meena Kumari’s songs on screen, I have always felt that the voice of Asha Bhosle suited Meena Kumari more. The depth that Asha ji brought to her singing, in my opinion conveyed the pathos of the tragedy queen more. This song is a rare song sung by Asha ji for Meena Kumari and conveys the pangs of separation as she pines for her estranged beloved. Sad yet sweet as the song is sung without much melodrama. 3. Halki halki sard hawa (Bombay ka chor, 1962): The next song is from a movie that stars Kishore Kumar and Mala Sinha. I remember watching it vaguely back in the eighties/ nineties; but have no clue what the context of this song is or for that matter what the picturisation is like. Regardless of who sings it on screen, this ‘typical’ Asha song, complete with its ‘western’ melody and instruments is memorable because of its lilting melody! 4. Yeh raastey hain pyaar ke (Yeh raaste hain pyar ke, 1963): Now this is one of my all-time favourite songs ever. Thanks to the release of the much hyped Akshay Kumar starrer, Rustom last month, this movie, Yeh raaste hain pyaar ke found a re-mention in the media – as it was one of the earliest movies based on the Nanavati scandal of the 1950s. While the movie was not that good, despite starring a gorgeous Sunil Dutt and a breathtaking Leela Naidu and the versatile Rehman, the musical score by Ravi was superlative. It had the lovely Rafi-Asha duet, Yeh khamoshiyan yeh tanhaiyan and that pathos filled Asha solo, Aaj yeh meri zindagi, among others. However, this song picturised on a dignified Shashikala remains my personal favourite. 5. Baharon ki kahani sunati hai jawani (Pyar kiya toh darna kya, 1962): Another song in the cabaret/ western/ supporting genre, this one, wrongly marked in the video as a duet, is picturised on the inimitable Helen and Shammi Kapoor. I love the way Asha sings the line – ‘deewane zara sunn..’, infusing it with a different emotion each time. 6. Dil ki kahani rang layee hai (Chaudhvin ka chand, 1960): This classic Guru Dutt Muslim social had a fantastic score with memorable songs. This mujra (? ), picturised on Minu Mumtaz, has the lady waxing eloquent about love as an ailment and what it makes people do. Asha Bhosle sings it with the much-needed lilt and energy. 7. Itni jaldi na karo (Aadmi aur insaan, 1969): Ravi had a very close association with B.R Films along with Sahir Ludhianvi – and the duo did pair up to compose some truly memorable scores. Aadmi aur Insaan is one such movie. I was torn as to which song to pick from the philosophical Zindagi ittefaq hai or the sad Zindagi ke rang kayi re or the melodious romantic duet, O neele parbaton ke dhaara; but settled on this one. While not as popular as the others, this is sensuous, soft and melodious at the same time. And Mumtaz and Dharmendra look good! 8. Uljhan suljhe na (Dhund, 1973): Another song from the Asha-Sahir-Ravi-BR chopra stable. I picked this over my all-time favourites from Waqt (Aage bhi jaane na tu or Kaun aaya ki nigahon mein), which creep in every post of mine. Dhund, a suspense film starring Sanjay Khan, Zeenat Aman, Danny Denzongpa and Navin Nischal had two very good songs from what I seem to remember. One was the philosophical Sansaar ki har shae ka and then this one. 10. 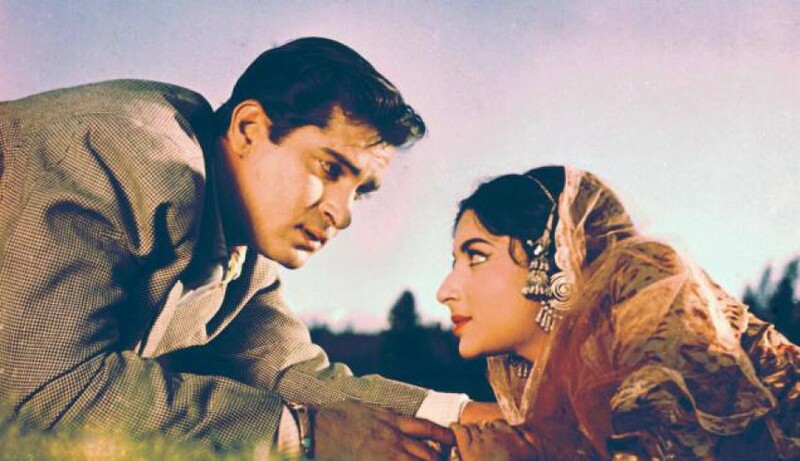 Yeh hawa yeh nadi ka kinara (Ghar Sansar, 1958 – with Manna Dey): Ending this song list with a melodious, romantic superhit duet picturised on Rajendra Kumar and Kum Kum and sung excellently by Ashaji and Manna Dey. This entry was posted in Old Hindi songs and tagged Asha Bhosle, B.R.Chopra, Dharmendra, Helen, Meena Kumari, Minoo Mumtaz, Mumtaz, O.P.Nayyar, R.D.Burman, Ravi, S.D.Burman, Sahir Ludhianvi, Shammi Kapoor, Sunil Dutt. Bookmark the permalink. What a return, Harini! Great post, and some really, really nice songs there. There were a couple I had to listen to in order to remember, but I eventually realized that I have indeed heard all of these. And the last one, in particular, is a big favourite of mine. Thank you for that! Thanks, Madhu! Glad you liked it…. Had to force myself to blog again ! Yeh hawa yeh nadi Ka kinara is such a sweet song… I just didn’t have the list to drop it while jotting down Asha- Ravi songs yesterday.